Coming just 1 year after the questionably successful Lake Champlain Quadricentennial, it’s just been announced that “review grants” are available for application. Grants to review the 2009 event. The National Heritage Partnership is now offering up to $100,000 for the Legacy Program. Individual grants up to $10,000 will be available for programs designed to capture the atmosphere of the 2009 celebration. It seems too unbelievable to be fake. I have a simple and cheap suggestion – A Good Website. If you want to archive something for the future, think about SEO. 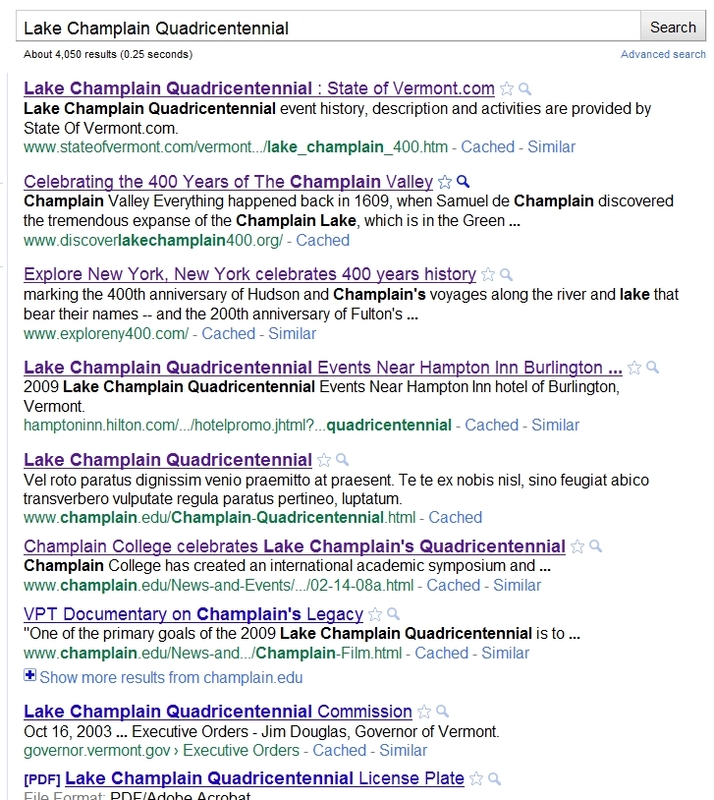 Let’s have a look at “Lake Champlain Quadricentennial – Google Search“. #1 – State of Vermont – They own the top-position with a dead page. Must be a lot of people are linking to this essential resource. 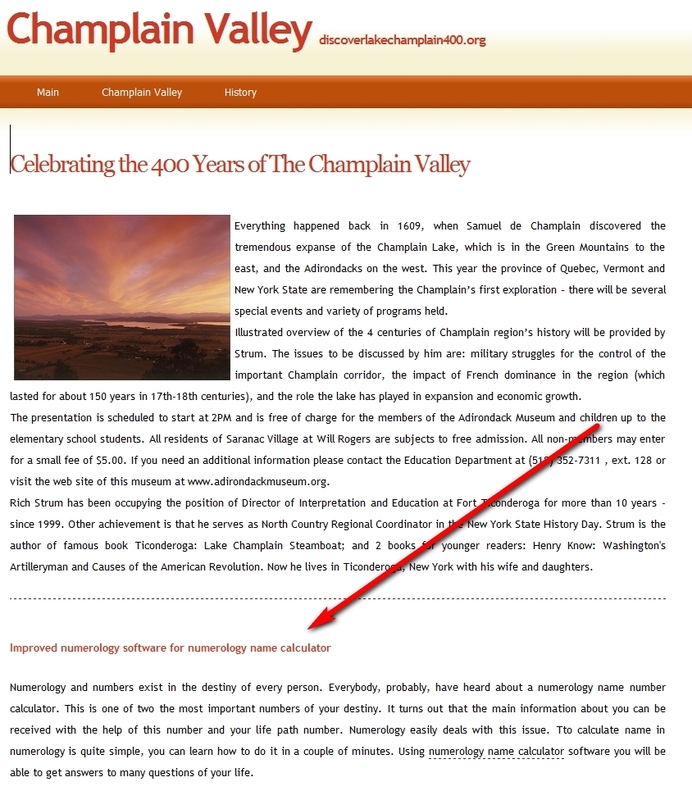 #2 – discoverlakechamplain400.org – A little blah, blah, blah content, plus a bonus link to a numerology name calculator gets you second-spot. The word Quadricentennial doesn’t even appear on that page! 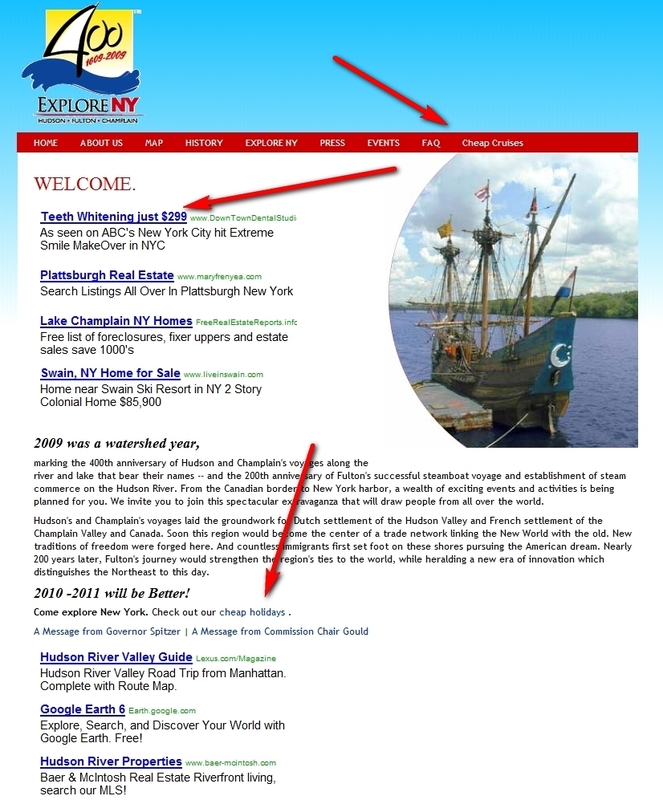 #3 – exploreny400.com – I think this was an official site of some sort, now owned by someone in Vanautu. Great for a static Google Ad site – love the Teeth Whitening information and spammy links! Maybe one of those $10k grants could buy this back from him. #4 – hamptoninn.hilton.com – Hampton Inn, Burlington. We should find out if their superior SEO converted into massive Quadracentennial economic-impact. #5 – www.champlain.edu – Champlain College scores in the top-5 with a relevant page-title and probably some inbound links. Oh yeah, and one link they include is totally dead. I think this is a good example of Google giving too much authority to .gov and .edu domains. As if academics and govt workers would know better. Title, Content, and Inbound Links…. it’s really that simple. Why don’t you prepare a grant request to build a wordpress site? You could use $10,000 eh? The thought has most definitely crossed my mind. Just check grant info – Deadline is Dec 22nd. I must have missed the original announcement. as the ward of a .edu domain i have to say I appreciate the extra google juice they throw our way. We do try to use our powers for good but I admit that we rarely succeed. Heh, no offense intended. I’m just assuming that somewhere in the Goog’s algorithym .edu’s and .gov’s get preference over “normal” sites. That might not even be true anymore.